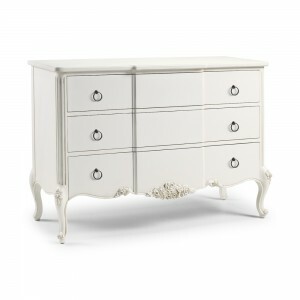 Hand crafted from solid mahogany our five draw chest is an exquisite storage solution to bring together any bedroom. The silver leaf finish is a marvel of rococo design and accentuates other pieces in our Alexandria range with style and sophistication. Floral carvings dot the curves of the base and create beauty in the structure of this piece, the playful silhouette of our Alexandria chest exudes a virtuous aesthetic and is not to be seen as anything other than a blessed furnishing.